The Behmor Brazen Plus is a great investment if you’ve got a few extra minutes…and maybe a dish towel nearby. SHORT VERSION: The Behmor Brazen Plus takes a few minutes longer than other coffee makers because it heats the water completely before doing anything. If you can live with that, and if you insist on nothing less than great coffee, this is the machine for you. The Behmor Brazen Plus Coffee Brew System looks like it belongs on the set of a Star Trek movie. This isn’t a bad thing at all; most people like its futuristic look. The footprint of this coffee maker is 9 inches x 9 inches and the unit stands a little over 15 inches tall; the reservoir lid is removable, not a flip-up, so there should be no issue with it fitting under kitchen cabinets. The stainless steel reservoir is easily accessible and the control panel features a nice backlit LCD display. This coffee maker also comes with an 8-cup stainless steel thermal carafe, eliminating the need for a warming plate. A permanent gold tone filter is also included! Score. If you prefer paper filters (cupcake-style), just remove the permanent filter and drop the paper one in. 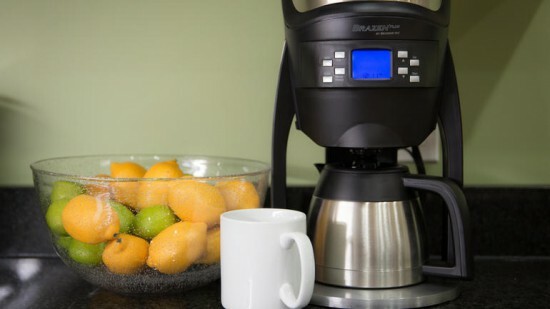 The Brazen Plus makes great coffee. Even people who are otherwise unhappy with this coffee maker say so. 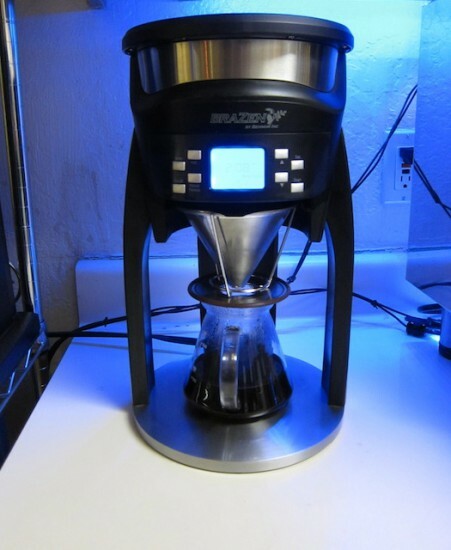 Everything about the design and features of the Behmor Brazen Plus suggests that Behmor wanted to build a machine that could really make the perfect cup of coffee, and most Brazen owners agree. The oversized showerhead inside this machine is no doubt one of the reasons it succeeds in that respect, but there’s a lot more to it than that. 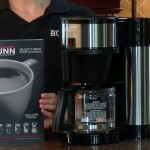 Along with the Bonavita BV1800 (read review here), the Brazen Plus is one of the few coffee makers certified by the Specialty Coffee Association of America (SCAA). The SCAA is very stingy with its certifications, so that’s a pretty big deal. 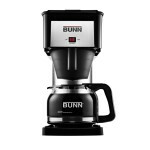 It has an adjustable heating control that will heat water to anywhere from 190° to 210° F and, unlike a lot of other coffee makers, it completes this heating process before water begins to flow. Yes, this means you have to wait a bit longer for your coffee (aww, first world problems), but water will be at the correct temperature the moment it hits the grounds. The SCAA and other coffee organizations recommend that water be somewhere between 195° to 205° F for brewing coffee, and this coffee maker has a wider range to allow for differences in altitude. The Behmor Brazen Plus can (and should) be calibrated to the elevation at which it is being used because elevation affects the point at which water boils. In case you weren’t paying attention in high school science class, water at high elevations (e.g. in Denver, Colorado) will boil at a lower temperature than in places like Chicago, Illinois which is several thousand feet closer to sea level. 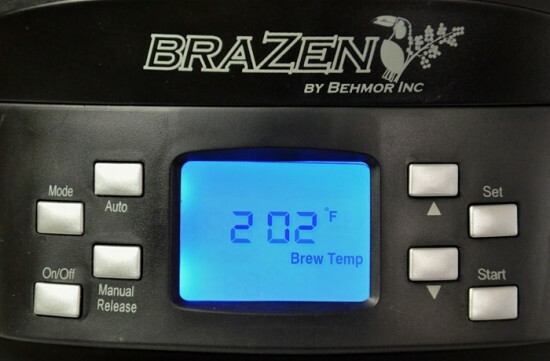 Given the importance of water temperature in the brewing process, it’s pretty significant that the Brazen Plus is designed to account for elevation. The owner’s manual included with this machine has a handy little chart that shows the elevation for most of North America’s biggest cities, but if yours isn’t listed you can always google it (the same way I googled the relationship between elevation and boiling points). Another one of the many features that makes the Behmor Brazen Plus special is its pre-soak setting. 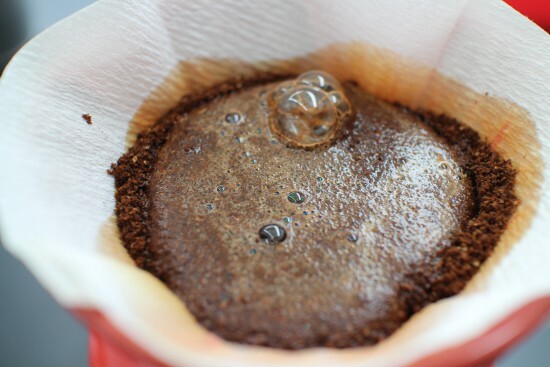 Pre-soaking coffee grounds allows them to bloom which, in coffee parlance, means that carbon dioxide within the grounds is being purged and hot water is moving in to begin the extraction process. This is big because it can have a major effect on how your coffee tastes, and the pre-soak time can range from 15 seconds to four minutes. New owners of the Brazen Plus will want to experiment with pre-soak times to get it just right. Past victims of “plastic taste” in coffee will appreciate the stainless steel water reservoir, although the brew basket is made of plastic. Despite this, plastic taste isn’t a complaint that you’re likely to hear from a Brazen Plus owner. As mentioned earlier, this coffee maker also comes with a stainless steel thermal carafe, and of course it’s programmable. For $200 it had better be, right?! Stainless steel water reservoir. No more plastic taste in your coffee! One last reason to buy the Behmor Brazen Plus is that Behmor’s customer service is, by all accounts, outstanding. 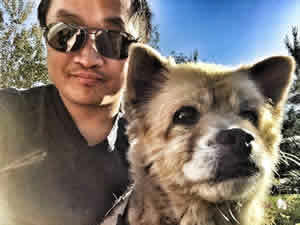 They even have someone (Todd Larrabee, as of this writing) monitoring negative reviews on Amazon.com and addressing specific customer complaints because they’re just that committed to making sure customers are happy. Given the price of this coffee maker you’re certainly going to expect it to work as promised, but if there’s an issue you can feel confident that Behmor will try to make it right. With all the awesome features the Behmor Brazen Plus comes with, what could anyone complain about? Well, as I’ve already pointed out, this isn’t the fastest coffee maker in the world. 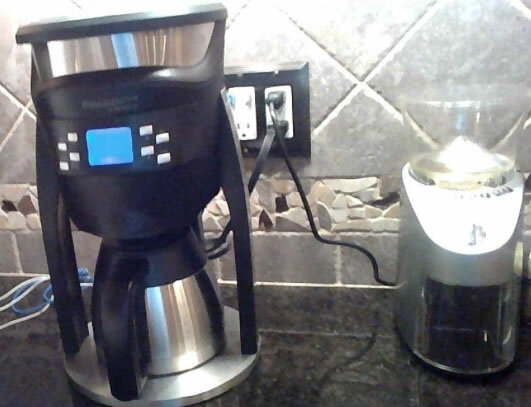 Between pre-soak time (depends on your settings) and waiting for the water to completely heat up, this coffee maker has elicited complaints from some impatient coffee drinkers. One owner in particular clocked the brew time at 14 minutes, including a 2.5 minute pre-soak. Those people probably should have invested in a Bunn Velocity Brew (read review here) which keeps water heated at all times, not just when it’s time to make the donuts (btw if you get that reference, you’re old). A lot of complaints center around the carafe in one way or another. Many say that it’s too small. Maybe they’re used to 10 and 12 cup carafes? Some even claim that it doesn’t really hold 40 ounces and yields “5 or 6 cups” even though Consumer Reports lists the “measured capacity” at 40 oz. I’m not a huge fan of Consumer Reports, but I trust their ability to measure how much coffee a carafe can hold. 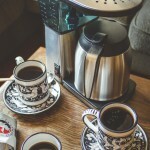 A few Behmor Brazen Plus owners also say the carafe doesn’t keep the coffee hot for long enough, stating that the hot coffee range is about an hour, give or take. Owners of the Bonavita BV1800SS (read review here) have similar complaints. Others complain that the carafe leaks a bit, and a couple have said that coffee gets trapped inside a plastic part inside the carafe. 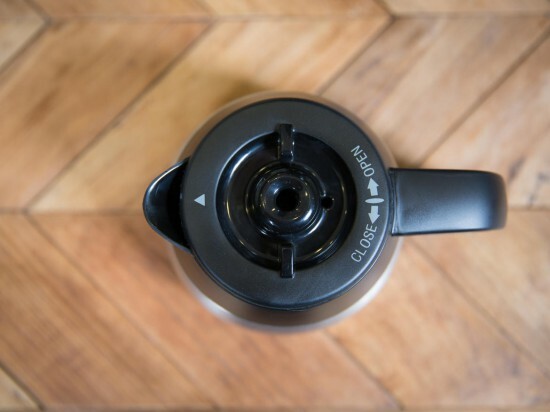 Bird’s eye view of the Behmor Brazen Plus carafe. The little arrow is there to tell you which way is front. Aside from the carafe, another relatively common complaint is that the Behmor Brazen Plus has a tendency to spew some hot water here and there. Boiling water has been reported to be spit out of the top of the machine and some have said that removing the filter basket prematurely can result in an unpleasant hot water surprise. The good news is that these issues sound like they are easily fixed. If boiling water is creeping out of the top of the coffee maker, make use of the Brazen Plus’s adjustable temperature control. Water that’s hot enough to boil up like that is probably too hot for brewing coffee anyway. 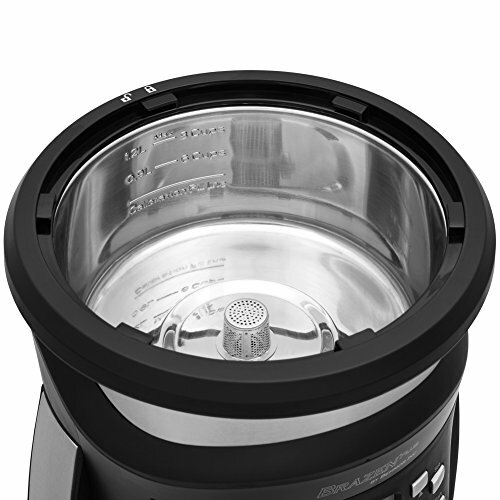 The Behmor Brazen Plus is a great coffee maker for those who care more about coffee quality than brewing time. It takes a little longer to brew than other coffee makers, but that’s not a design flaw. It’s supposed to take a bit longer to ensure that the water is hot enough to brew a great cup of coffee. The carafe may not be perfect by any stretch of the imagination, but its flaws seem like a pretty minor tradeoff for adjustable brewing temperature, altitude calibration, pre-soak blooming, manual release, and a stainless steel reservoir. There’s a lot to like about the Brazen Plus and it comes with features that no other coffee maker has. If you want great, hot coffee from a really cool-looking machine that’s packed with technology and features, this is it. BUY IT with confidence, unless brewing speed is an issue for you . If you want good coffee fast, go with the less expensive Bunn Velocity Brew (read review here). The Behmor Brazen Plus is better for more demanding coffee drinkers who don’t mind waiting a few extra minutes. Don’t Buy this Coffee Maker if you are looking to eliminate plastic, there is plenty of plastic in this baby that is in contact with the hot vapors of the boiling and brewing process. The Carafe design stinks, and you waste time cleaning up coffee that spills abundantly when you pour a cup. If you are in a hurry to get to work you will be spending time cleaning up floors and counter tops. The only way to use it successfully is to put your mug in the sink and watch some coffee go down the drain. It is quite Brazen that the company thought the could get away with this coffeemaker satisfying customers. They were close but need a stainless steel lid on the boiler, and a stainless steel lid on the carafe that did not leak, and a stainless steel filter. holder.